This leads to so many important questions, like: were the Cars Little Boy and Fat Man nukes sentient? Was it a suicide mission? Are ALL Cars nuclear weapons sentient? Did Tsar Bomba have a personality? Was there a Cars 9/11? Were the planes hijacked, or were the planes themselves radicalized? Who made the first car or did they evolve from so other machine that came before them. Did cars have racial segregation if so by what can a car just change its paint job and its now another car race? Hitler was definitely an old-timey Volkswagen. On the subject of 9/11, I think the planes were terrorists, perhaps posing as american airlines planes to get closer to the WTC. I don't think the nukes were sentient, as they're not really automobiles. Another question: what were the Cars jews? "in Cars 2 one of the racecars mentions their mother. and then the racecar waves to his mother in the audience. one automobile birthed another automobile. when Mater tries to convince a car that he is not a spy, he says “i’m not a spy. my specialty is towing and salvage”. the car responds by saying “right. and mine is developing iPhone apps” before winking. not only is this a poorly placed pop cultural reference, but they have iPhones in this world. smartphones. Cars can hold mobile phones and use them and use their touch screen for various uses. in Cars 2 there is a Pope. The pope is a car in a pope hat. he rides around in a Popemobile. a CAr is riding in another car. they make reference to the Popemobile. “is the Popemobile Catholic?”, Mater says as a “well duhhh” moment, much like our saying, “Is the Pope catholic?”. presumably this means the Popemobile is employed and must be specifically Catholic in order to be the chauffeur and carrier to the regular pope. Also, Catholicism is in this Universe. this means that there must have been an actual Jesus Christ car. also they mention at one point that gasoline is a “fossil fuel. as in dead dinosaurs!” so there must have been dinosaurs at one point in the Cars universe but were they actual dinosaurs or car dinosaurs how did this civilsation start"
Maybe the cars in Cars are advanced, AI driven, repopulating self-driving cars developed for human transport, but ended up out-living humans and becoming the dominant… species? of earth. Y'all seem to forget they have bugs which are cars, there are two Planes movies, and I think we've seen a helicopter. Society fell because we made cars too advanced, there was no car Jesus or WWII because it already passed. This is why car compactors exist, as we can see in Cars 2 after Leland Turbo's death. Why would car compactors exist in a junkyard? You could say the same thing about why would humanity create the electric chair, but that was made for the death penalty, this car compactor was in a junkyard, so unless people in the Cars universe simply do not care about the dead, we can assume this was made by humans to crush cars that no longer worked. My question is, how does their biology work? They clearly have eyes and tongues but where does that moisture come from? They have doors that clearly aren't meant to be opened. We need to get the world's greatest minds to focus on this instead of solving world hunger or whatever they're doing. So the cars act like humans so we can assume their body works like humans. That means the parts in the car are their organs and the metal frame of the car is their skin. Does this mean that their paint is clothing? 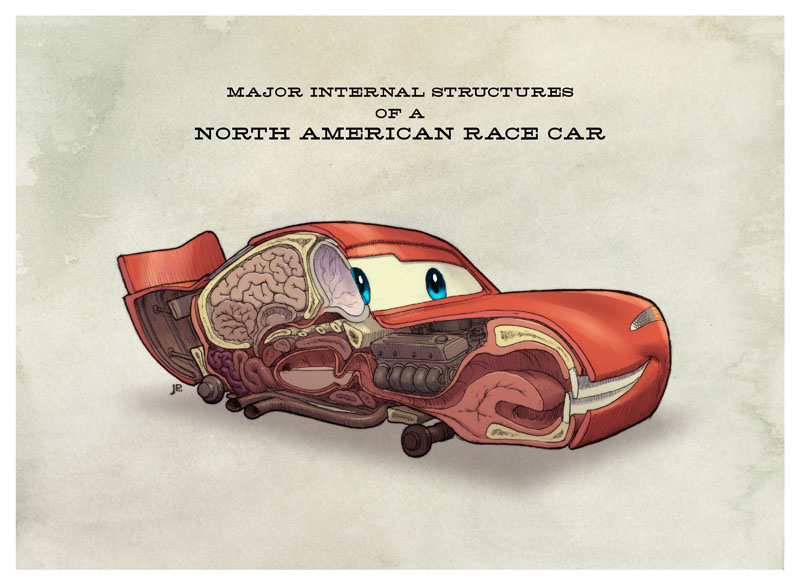 I would like to see a diagram showing the anatomy of a car. A car has seat belts in the front and back. You use the verb fasten, when you put your seat belt. John fastened is seat belt before driving off. You use the steering wheel to control the direction of the car (steer the car). The windscreen is the big window at the front of the car. Are the things used when it is raining, snowing or clean dirt of the windscreen. They are used when driving at night and when it is raining, snow or fog. The lights that are at the back of the car are call lights. The orange light are called indicators and are used when the car is turning left or right. The white part is called the reverse light and lights up when the car is reversing backwards. The red part is used when the head lights are being used so other drivers can see the car in front of them at night time or poor driving conditions. It is also called a brake light and is used when the car is using the brake pedal. The speedometer shows how fast the person driving the car is driving. Shows how hot the cars engine is. This shows the driver how many miles the journey has took. The rev counter is used to help you change gear and can be used for better fuel economy. Or does this mean their color is their race is there car inequality, was there an Apartheid South Africa? Car slavery in the history of cars? This creates another question were does car history begin do they believe in evolution? Are there religions in this world? What did car Buddha look like? How was car Jesus killed? I spoke to admin about this, he said that he thinks segregation was based on fuel type, so diesel cars would be enslaved by gasoline consuming cars, etc. electric cars? and what would be the superior Aryan race be? We know that they still have races from cars 1 when they had the cars with the Italian accents. Does this mean they have racial slurs for car races? Does this mean that they can only have a spectrum of paints depending on their race. Example: Caucasian cars can go from tan to white.